Imagine being able to launch a Spring Snake from any container, including a paper bag, hat, silk, Halloween mask, your shoe or even another snake! Now you can throw away your can of peanuts, because AmazeKids and our partner from Wolfs Magic have Insta-Snake. 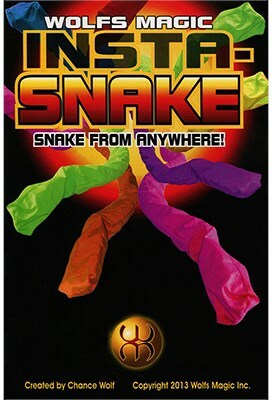 This gimmick gives you the power to launch a giant 40” snake right in the palm of your hand. Literally. You can even do this bare-handed if you wish! Insta-Snake revolutionizes the Spring Snake Production. The gimmick is 1” high and 3” in diameter, so you can palm it in your hand just like a jumbo coin or easily hide it in a bag, hat or under the cover of a silk. Don’t be restricted to producing Spring Snakes from the predictable peanut, chip or tennis ball can. The magical and comedic possibilities of this well-thought-out device give you many more options. Watch the above video to see Insta-Snake in action. You’ll see that some of the productions require a bit of sleight-of-hand, while others are almost automatic. The body of the gimmick is machined from a high-density polyethylene. It has an aluminum lid and latch system so you are in control of the moment when the snake pops out. Its “grip tape” sides assure a no-slip handling. Best of all, the reset is less than 60 seconds. One 40” long quality cloth snake. Color is randomly chosen. If you want to add a magical surprise to your show, this is a compact, pack-small, play-big prop that will do the trick. Some of our customers have purchased several because Insta-Snake makes a great running gag as you can wow yourself and your audience over and over again. If you’re a kids magician, clown, juggler, prop comic or just someone who likes to play an occasional practical joke, Insta-Snake will create a surprising moment that they’ll remember for a long, long time.